Valor essential oil blend from Young Living is one of my favorite oils. I use it every day with EFT. This week I had to make a trip to the dentist office which is something I have avoided like the plague. To say the dentist terrifies me is a gross understatement. Sometimes we have to face our fears. I broke the crown of a really old root canal and it needed to be fixed. It turned out that the remaining part was split so badly that the tooth couldn’t be saved and I had to have it surgically removed. Time to put Valor Oil and EFT to the test. All I can say is WOW! I used Valor along with two EFT audio sessions I had bought from Brad Yates quite some time ago. I had bought several of Brad’s eTappings for abundance but I bought the dentist tapping sessions because I knew I had a fear of the dentist and I knew I would someday be thankful I did. I saved the EFT audio sessions and never used them until this week. People are always asking me if EFT really works or is it something that I just hope will work. I know it works because several years ago I released my fear of flying. Having that fear gone is really nice. Now when I get on planes I have no fear. I actually enjoy it. I used the EFT and Valor Oil the night before my dental appointment. I slept like a baby and had no worries or stress. I repeated the EFT sessions again the next morning as I was getting ready to go. Feeling AWESOME and no stress. I felt calm all the way, even in the dentists chair as he was getting ready to start working on me. This experience was a true test for me. I have known the power of EFT for quite some time but the removal of intense fear of the dentist drives the point home even stronger. 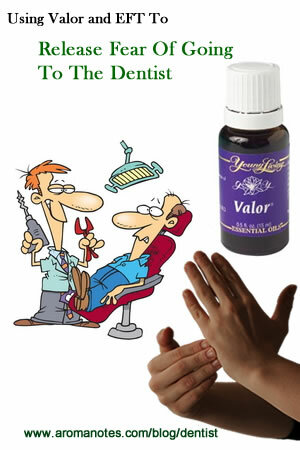 Valor Oil blend is for courage and is one of the best oils to use with EFT. To use an essential oil to enhance your EFT sessions, put a couple drops of essential oil on your fingertips before you begin tapping the EFT points. If you have a fear of going to the dentist, you might want to use Brad Yates eTapping on Fear of The Dentist. He has a lot of other good ones on the list that you may benefit from. The Law of Attraction is an amazing energy. It is always at work. We attract whatever matches the energy or vibrations we are sending out or radiating. If we have a fearful energy because we are listening to the news and hearing about how bad the economy is, we will attract negative things. It becomes more difficult to attract the abundance we want in our life. 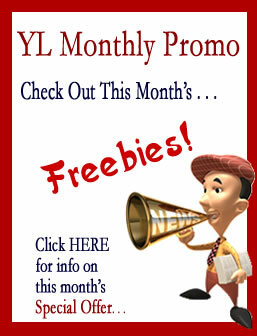 I have been using Young Living Abundance oil for many years. 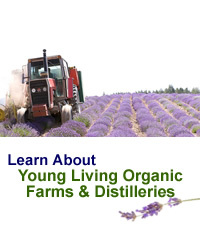 It was the essential oil I used when I got started in with Young Living in 1997 and it is the reason I am building a business with Young Living Essential Oils today. 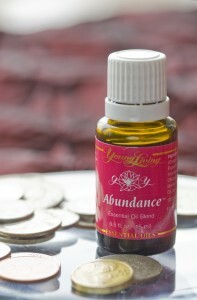 Abundance oil raises your energy to a more attracting energy. It also is very mood uplifting. Abundance is a wonderful oil to enhance the Law of Attraction. EFT is also a powerful tool to use along with the law of attraction. 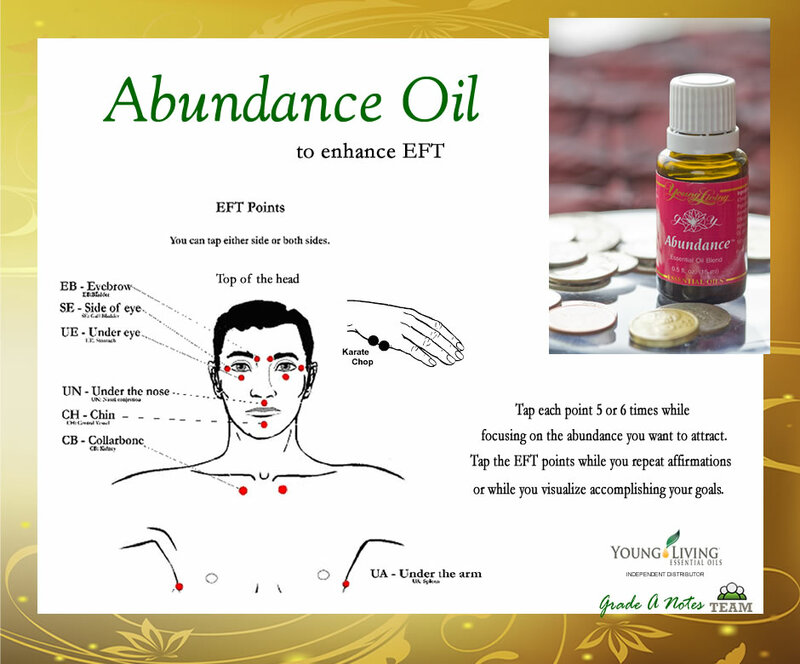 Put EFT and Abundance oil together and you have a really powerful tool to attract abundance. Daily EFT can really set the tone for your abundance energy as you set about to do the daily tasks in your business. Not only does EFT help remove fears but it also enhances the law of attraction. If you are in any kind of business, you need to have a good energy that attracts abundance and success. This good abundant energy is needed in all aspects of our life, not just business. We can be abundant in all kinds of ways. When we have a good positive energy, we have a better mood and things just seem to work better. We have more fun in our life. Abundance overflows into all areas of our life. The EFT tapping session in the video below is full of positive affirmations around attracting abundance. Put a couple drops of Abundance oil blend on your fingertips and begin tapping.